The summer of 2009 saw Tumbleweed bring a winter of discontent to Evergreen Park in Brooks for their annual Little Bard on the Prairie offering. Taking their cues from artist Edward Gorey, Tumbleweed's costumes, set design, make-up and even poster design took on a much more darker and edgier feel. 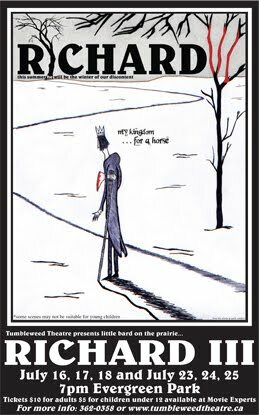 With Richard III, Tumbleweed tackled their second Shakespearean tragedy and their single longest running production yet. Shakespeare's most diabolical villain was brought to life with Arnold Burkholder taking the title role and Michael Glynn Macdonald returning to helm his third Shakespeare production after a two year absence.